A Thoughtful Paper turned 5 today and WordPress was kind enough to remind me! 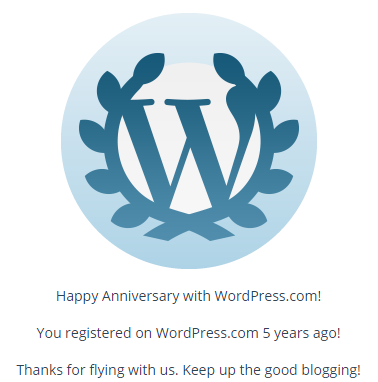 So, it’s been five years of blogging at WordPress and eight years of blogging for me! Hurray! It’s been difficult to sustain this blog particularly with all the activities for school and work. But blogging has been a very good way for me to de-stress and there isn’t a better way to document all my experiences! I didn’t intend for A Thoughtful Paper to be a travel blog and I still don’t intend to. But since travel occupies a third of my life today, the blog sort of turned into my travel diary. Blogging at WordPress has been and is still a good experience. I get to meet a lot of people though admittedly, I am guilty of not visiting my followers’ blogs as often as they visit mine. But thank you my dear readers and friends for constantly dropping by and for leaving comments. I may not voice out my appreciation as often as I should but you guys make blogging a lot more fun and insightful. 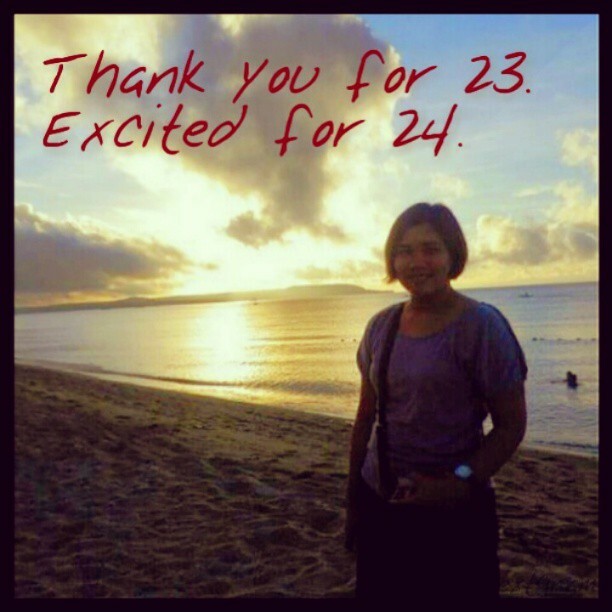 I look forward to more years of blogging, sharing experiences and meaningful discussions! I am blessed for being to able to realize this goal in my 23 years of existence. Life has not always been kind but it has certainly been rewarding. I look forward to more years of fruitful existence. I know you are extremely intelligent and talented. You could have been successful way beyond what you imagined. However, you gave up your job when you were at your peak and chose to take care of us. You were and still with us 24/7. While growing up, you were strict with us. You never allowed Papa to give us something just because we want it. However, you never made us feel that we lack anything. This is why until now, we never feel insecure or bothered by the lack of some material things. We always have your support. You never insisted on doing things your way. In every decision, you silently watch how we would traverse the path we chose. If we succeed, you are the first in line to acknowledge our achievement. Even in failure, you never made us feel that we are less than what we used to be. Despite our differences, you never made us feel that you favor one over the other. You emphasized our differences and how we should not be judged according to that. I never understood your brand of kindness. How are you able to help others when you are also in dire need? How can you still trust people when they have fooled you repeatedly? How can you rely with just words of honor as your insurance? It’s still beyond my understanding but I know it’s because you are selfless. I know that you will always put other people’s sake above your own. You never hesitate to that point that I sometimes wish you could have been more selfish. I started the day with a very sullen mood. It was the first time I’m celebrating with no immediate family around. I suddenly recalled my past birthdays. At 20, I celebrated my birthday on my graduation day. At 21, I went to the beach with my brother and several cousins. At 22, I celebrated at home just in time for Easter Sunday. At 23, I do not know to what expect. I thought, “Should I even expect in the first place?” So when my mom called me this morning, I couldn’t help but shed a tear as I told myself, “This is going to be one of the coldest birthdays ever”. But as they say, God always has a plan. When you can’t do anything for yourself, He will intervene through other people. As the day went by and greetings came pouring in, I realized that the essence of celebrating a birthday is not the food, nor the gifts, but the celebration of life itself. It’s about being thankful for being alive, being able to see what life has to offer, being loved and giving love as well, being able to laugh at absurdities, and learning from our mistakes. Having said that, I now feel more confident than ever to say… Thank you. Thank you God for giving me the gift of life. Thank You for providing me with abilities to do my purpose and find out whatever that is You have in store form me. Thank You for giving me such a good family, supportive relatives, awesome friends and mentors, and great co-workers. Thank you to anyone and everyone because in a way or too we all contribute to the state of the world we live in. November is just around the concern and what does this mean? Trip to Bicol to visit those who have already gone ahead of us. For working people like me, it’s like hitting two birds with one stone as I get to have some vacation too. There was a time when I totally loathed November. Why? Because it’s the month that one of the most important people in my life was taken from me. November is a painful reminder of what I’ve lost and how my life has turned upside down. But time is kind. Wounds heal. Pain subsides. People mature. Nowadays, I am looking at November with more optimism. It’s because I’ve also received so much blessing during this month the past years. My mom celebrates her birthday during November. I have enough reason to thank God for giving me such a good mom. November 2011 will also mark my 2nd year at PCHRD. While I feel I am getting farther and farther from where I initially imagined myself, I could not ask for better workmates. So November, come fast! I can’t wait for you to come. 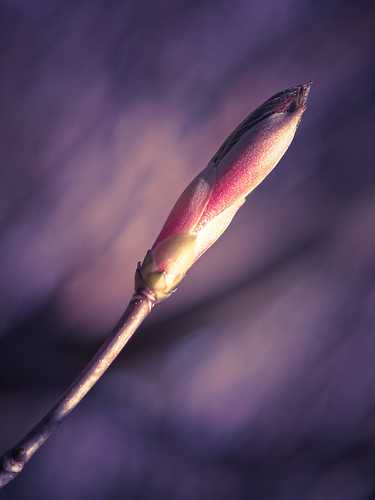 As one grows older, one will slowly realize that true happiness cannot be experienced from material things but from the smiles and love of people you care for. One digit doesn’t really make a big difference but a year of experience can have significant effects in the perspective of a person. Tomorrow is my mom’s 52 birthday! To my dearest mom, sister, and bestfriend… Happy happy Birthday! That’s me and my mom goofing around last Nov 1. Ehr. I don’t look like her in any way. >_> I happen to be a living replica of my dad. Anyway, Mama! Thank you for everything. You know I am not a very “I love you” person, but I know you feel it. You know you can always count on me and trust me that I’ll always fulfill my role. Thank you for your endless patience and love. I couldn’t ask for more. As I have said, if reincarnation do happen, I’ll always wish to be your daughter. Happy Birthday!